System gain greater than 72dB! This system is ideal for smaller applications such as offices, homes, small factories or warehouses. All CAE500 Econo Packages including Tri-Band Mobile Repeater Kit come with all you need to get the system working Tri-Band Repeater Kit is compatible with all UK and European mobile phone voice and data networks and effectively provides a strong and reliable signal in places with poor reception. CellAntenna Tri-Band Kit comes with everything you need to boost coverage in your area! This product is simple to install, comes with 100% free technical support and 12 months guarantee. 4. 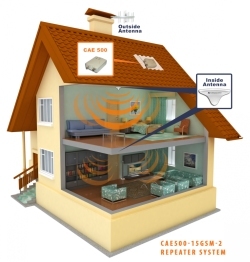 Locate the Internal Aerials install on ceiling (or wall) and connect cable from aerials to Amplifier. 7. Rotate External Aerial until maximum signal strength on phone inside the building in the area covered by the internal aerials is achieved. 8. Securely Fasten External Aerial. There are laws that govern the use of these products in various countries. We suggest referring to the governmental organization having jurisdiction. All CAE50 and CAE500 repeater products are offered in Europe through CellAntenna Corporation USA with shipping based on local charges. "THE USE OF THIS EQUIPMENT MAY REQUIRE A LICENSE. PLEASE CHECK WITH THE GOVERNMENTAL AUTHORITY HAVING JURISDICTION PRIOR TO USE"
NOTE: According to the R&TTE Directive all of our amplifiers are CE approved by licensing body and fully compliant. The country in which all our CE products & amplifiers were introduced to the market is Poland (CellAntenna Sp. z o.o.). Declaration of conformity available upon request.